Twilight fades and night begins over Rainbow Bridge. Photo by Brent and Dawn Davis (http://www.brentdavisphotography.com/). 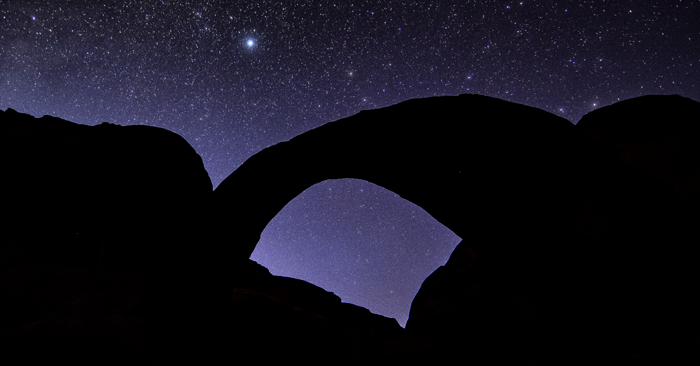 Rainbow Bridge National Monument and the International Dark-Sky Association (IDA) are excited to announce the designation of Rainbow Bridge National Monument in Utah, U.S., as an International Dark Sky Sanctuary. The Sanctuary designation is the first of its kind in the National Park Service, and distinguishes Rainbow Bridge National Monument for the quality of its naturally dark night skies and the site’s cultural heritage. Rainbow Bridge National Monument is one of the smallest units in the National Park Service and encompasses just 0.65 square kilometers (160 acres) of land. It is accessible only by boat on Lake Powell or by backpacking in from Navajo Mountain. At least six area Native American Tribes, including the Hopi, Zuni, Navajo, San Juan Southern Paiute, Kaibab Paiute, and Ute Mountain Ute, consider the site sacred. Rainbow Bridge joins a number of other IDA-designated International Dark Sky Places on the Colorado Plateau of the western U.S., and becomes the eleventh International Dark Sky Place certified in the U.S. state of Utah. IDA established the International Dark Sky Places Program in 2001 to encourage the protection of natural dark night skies around the globe through responsible lighting policies and public outreach and education. Rainbow Bridge National Monument joins a host of National Parks on the Colorado Plateau with International Dark Sky Park designations recognized by the IDA and celebrated for their naturally dark skies. The designation will be celebrated with astronomy events throughout the year, the first of which will be held on April 21, 2018 at the Lake Powell Resort in Glen Canyon National Recreation Area’s Wahweap District from 7:30 p.m. to 10:00 p.m. (Mountain Standard Time). This event coincides with the final day of International Dark-Sky Week, the first day of National Park Week, and the year’s second National Park Service Free Entrance Day. In addition to these special events, visitors to the park can participate in a variety of astronomy programming ranging from star parties to solar viewing. These programs provide visitors an opportunity to learn about Glen Canyon’s skies and the continued efforts of the National Park Service and International Dark-Sky Association to preserve natural night skies. For more information about the IDA, visit the International Dark-Sky Association’s website. For more information about night skies in national parks, visit http://www.nature.nps.gov/night/. To learn how you can get involved in night sky preservation in Glen Canyon or to learn more about scheduled astronomy and night skies programming, visit https://www.nps.gov/glca/learn/nature/night-skies.htm.